This is Down On The Street Bonus Edition, where we check out interesting street-parked cars located in places other than the Island That Rust Forgot. Pulloa follows up the Punta Arenas Peugeot 404 with this Dearborn classic. 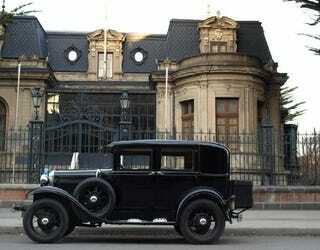 What i've got here is a 1931 Ford A. I knew of the existence of a few examples of this model here in my city, (Punta Arenas, Chile, the most southern city in the World! ), but i have seen them just twice, and they were different, as the ones i've previously seen were light blue and brown, while this one is black, and its the 4 door version (the others being the 2 door coupe), meaning this car probably spends most of its time in a garage. I got the oportunity to take pictures of this car thanks to my school. We are preparing an adaptation of the musical "The Phantom of the Opera", based on the movie by Joel Schumacher. If you havent seen the movie, it starts with a scene set in the beginnins of the 1900 century, with the character of Raoul, old and lonely, going to the then old Opera House, looking to remember a bit of his past. This scene is what we needed to shoot, to then screen it in the musical itself. As i take part of the A/V Team, i got the job of camera man. I was told by my teacher that they got for the recording of the scene a very old car, but that he didnt know the model or the year of it. So i went to the recording waiting for, maybe a 1940's or 1950's car, thinking they could get a better car for the scene. Imagine my surprise when i see a black Ford A! waiting outside the museum. Checking some info in the wikipedia, i was amazed at this piece of information: Between October 1992 to December 1994, Hector Quevedo, along with his son Hugo, drove a 1928 Model A 22,000 miles (35,000 km) from his home in Punta Arenas, Chile to the Ford Motor Company headquarters in Dearborn, Michigan. The car required minimal service including a flat tire and transmission work in Nicaragua and is now housed in the Henry Ford Museum. Actually, a very cool fact is that here in Punta Arenas it was located the oldest Ford dealer in the continent. It opened in the 1910's or 20's and it closed just 2 or 3 years ago. The car was in perfect condition, mechanically speaking, (and interior as well). We needed to tape it taking a spin around the city center, and it worked perfectly. It sounded in that typical Ford T-kind-of way. It also took around 5 people (the driver, one cameraman, two actors and one extra), even up to the typical steep hils in my city, without major problems. It was such a beatiful sighting, but i think i'll better let the pictures speak for themselves.